Entertain your guests at your next holiday celebration with games that add holiday cheer to the festivities. A few adult Christmas party games will incorporate a little spice to your gathering. Icebreakers are quick and easy adult Christmas party games intended to help guests get to know each other. For example, one popular game for getting guests to talk to each other is the people scavenger hunt. Instead of looking for objects on a list, they are looking for people who can answer yes to a particular Christmas-related statement like, "has gone caroling." Use a printable list, or create your own list of facts based on information you know about your guests. Both of these games ask guests to communicate an idea without words. In Pictionary, they must draw, and in charades, they must act out the word, phrase, or title. Create a list of Christmas-related words, Christmas movies, and Christmas carols your guests must try to guess. Divide the guests into teams, so that one team member draws or acts out the word and the other team member tries to guess the word. Use a timer to limit the guessing/charade/drawing time to 15-20 seconds. Each team takes a word from the pile and draws or acts it out. Team members can alternate who draws/acts. The team with the most correct answers at the end wins. Fill a stocking or a thick winter sock with Christmas-related items and seal the top. Then ask your guests to guess what is in the stocking by feeling it. Provide paper and pens so they can write down their guesses. 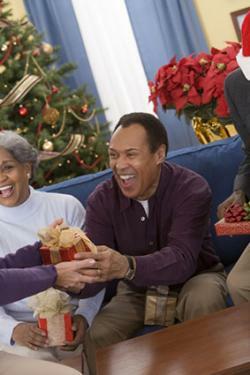 Set a time limit, or leave the stocking out for guests to play at their leisure. The winner is the person who correctly guests the most hidden objects. A guest begins the game by picking a random word from a Christmas song. Other guests try to guess what the song is based on the one word. If no one can guess the song, there can be a challenge where the person who picked the word must sing the song to confirm that the word is actually part of the song. Separate the group into two teams, each team facing each other. A member of Team A asks a member of Team B a question. Team B's answer is "Holiday Sausages." When providing the answer, the person cannot laugh or smile, or Team A gets a point. If the person keeps a straight face, then his team gets the point. Then, Team B gets to ask a question. The answer to all questions will always be "Holiday Sausages," regardless of which team answers. First team to score 10 points wins. Maintain your composure, and your team will rack up the most points! This is a great game for inside holiday gift jokes among families; just replace "holiday sausages" with your own inside joke, such as "kitty sweater" or "talking fish." Divide the group in teams of two. Provide each team with one roll of toilet paper, a scarf, a hat, and a pipe (if you so desire). Set a timer for 15 seconds to a few minutes, depending on how much time you have available for game play. One member from each team has to "build a snowman" out of their teammate, using the roll of toilet paper. They have to top it off with the scarf, hat, and pipe (if applicable). You can award a prize for the best built, the funniest, and the fastest snowman. Supply each party guest with a plain white paper plate and a magic marker. Tell the guests to place the paper plate on top of their head. Provide verbal instructions for the players to draw on their paper plates. Draw a line to create the ground. Draw a chimney on top of the house. Draw a door on the house. Draw a wreath hanging on the front door. Draw a sled with reindeer on the roof. Award points for each of the following items. He or she with the most points wins! Two points if the house touches the ground. Two points if the wreath is touching the door. One point if the door is on the house. One point if the chimney touches the house. Two points if the sled and the reindeer are touching the roof. One point if the house has decorations, like Christmas string lights, on it. Count off an even number of people. Large groups work well for this game. Write down the name of a popular Christmas carol on two slips of paper. Put all the slips into a bag, and ask everyone to draw for one. When the individuals draw their slip, they can't show it to anyone but they do have to start humming the song written on the paper. People then walk up to other people in search of the other person humming their tune. Once a matched pair find one another, they need to start singing the Christmas song loudly in front of everyone else, and they are the winners! Designate as many winners as you like, and present them with a small token of goodies. Divide guests into two teams. Give each team a word related to Christmas. Each time the chosen word is mentioned, the team with it takes a drink. Have guests take turns singing lines from the song. One guest begins by singing the first line and others continue by singing the next. If someone messes up or forgets a lyric, he or she must take a drink. 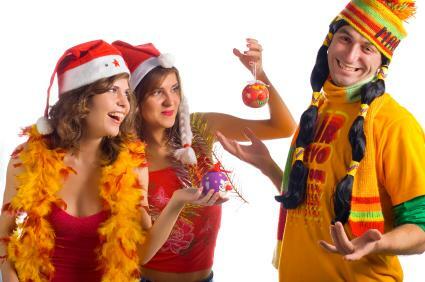 In the party invitation, request guests bring a "white elephant" gift, or one that's funny, weird, and/or likely to be unwanted. Everyone who has brought a gift then draws a number. Turns will go in numerical order. When your number is called, you may unwrap a gift from the pile or take a present another person has already opened. Put a twist on the white elephant exchange and choose to not unwrap any of the gifts until the end of the exchange. This variation adds an extra element of mystery and luck. The plotting and friendly theft involved in the exchange make for great entertainment. Everyone sits in a circle holding a gift. Someone reads a Christmas-themed story that includes the words "left" and "right" several times each. Every time the guests hear "left" in the story, they pass the gifts to the left; every time they hear the word "right," they pass them to the right. At the end of the game, you get to unwrap the gift you're holding. Saint Nick ran through the workshop on Christmas Eve. The reindeer pranced nervously as they awaited their fates. Mrs. Claus looked up in surprise as Santa entered the Christmas kitchen. John just wished this Christmas Day was over. The types of games that you feature at your Christmas party should reflect the type of guests you have attending. When planning games, having a creative mix will ensure that everyone feels comfortable and can take part in the fun. Play a few traditional games that everyone knows how to play and then include a few new ones.